With the Moto X already announced and preparing for US launch, Motorola has started revealing some of the accessories that customers can get. 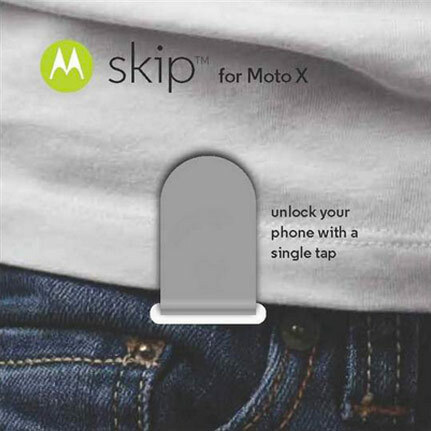 The coolest of them all is the Skip, an NFC accessory for automatically unlocking your Moto X. The Skip is listed as a “wearable accessory” and is simply a fancy NFC tag that unlocks the Moto X with a single tap. It also features a little clip allowing you to snap it onto a piece of clothing. The Moto X Skip accessory will retail for $19.99. Moreover, Motorola will include one with every Moto X order made through the Moto Maker website. Motorola has also launched a companion app to go with the Skip accessory that helps you set it up. It’s can be found and downloaded from the Play Store (pulled down at the moment). The company has also launched a couple of docks for the Moto X. Called NavigationDock and PowerDock, they are pretty self explanatory. The former is meant to be attached to the front windshield of a car and allows you to use Moto X for navigation, while the PowerDock is used to provide juice for the Moto X battery. Both can be ordered directly from the Motorola website and cost $39.95 each.